Work From Home Warnings Will Real Writing Jobs Help You Find a Real Writing Job? Will Real Writing Jobs Help You Find a Real Writing Job? Rating: 1 The jobs are nothing spectacular and can be found online for free. The Good: You are introduced to the many different ways you can earn money through freelance writing. The Bad: The site lists writing jobs that are freely available through Craiglist, UpWork, etc. Much of the tutorial information is generalized and outdated. Also, your personal information is sold to third party telemarketers, who will call and mail you. The Bottom Line: There is a ton of useful information about freelance writing that is already available online- and for free. You're better off sticking to free resources and avoiding giving out your personal information to this sham business. As a freelance writer, I’m always looking for the next writing gig. 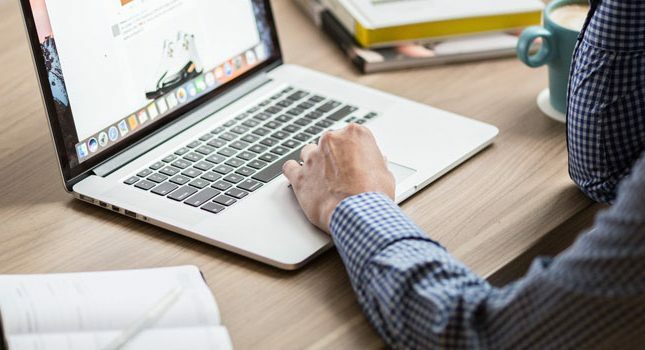 That’s why I was intrigued by Real Writing Jobs, which proposes to connect freelance writers with writing jobs that are not only lucrative, but which can be completed from home. 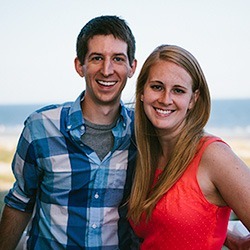 When I visited the RealWritingJobs.com website, I encountered the following sales page. Also, if you look at the above ad, you’ll see an American flag- yet the ad states that workers are being accepted worldwide. After I input my name and email, I was taken to a second sales page. Here, I was again told about how freelance writing has experienced “explosive growth” and how I can work from the comfort of my own home. Real Writing Jobs offers…paid online surveys? 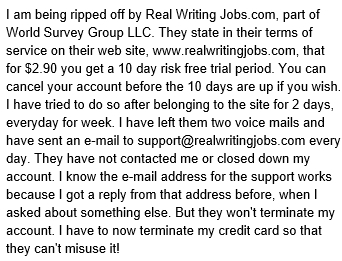 Real Writing Jobs offers “proof” that you can make $110 just from writing a simple review. You are shown the following (mostly blurred out) check for $110, which is derived from Survey Savvy. Survey Savvy is NOT defined as a freelance writing site. It is actually a paid online survey site, and it DOES NOT pay you for your writing. In fact, you could write all day for Survey Savvy- but if you are disqualified because the site is looking for a different demographic, you do not get paid for your ‘writing’ efforts. However, when you consider who actually operates Real Writing Jobs (discussed later in this post), it makes sense that you’d be filling out online surveys instead of actually writing. There are other issues with Real Writing Jobs that go far beyond the depiction of a $110 survey check. The jobs are available for free. I find this claim laughable because the jobs that are offered via this site are listed absolutely free on job sites like UpWork, Craigslist, etc. Other jobs can easily be found by performing a Google search or even by reading online posts such as this one. If you try to leave the sales page at this point, your asking price s lowered from $68 to $24 and finally to $12. However, I find even the low price of $12 to still be too high. Why? Because there is no guarantee that the writing jobs delivered to you via RealWritingJobs.com will result in paid work. You still need to apply and submit writing samples, which means you could still be rejected and have no work. The $3,780 free writer’s tools package is outdated. 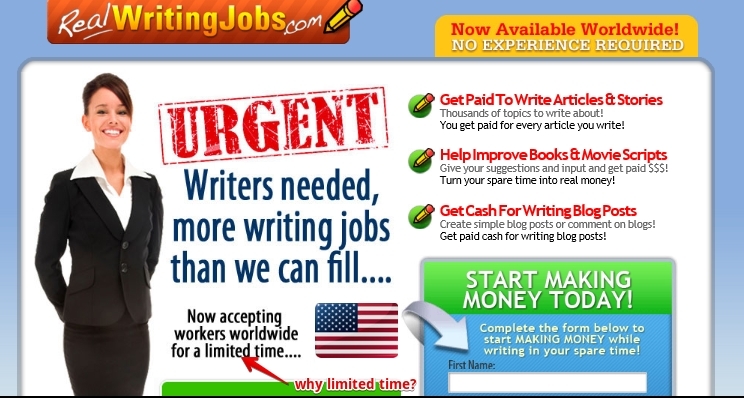 Real Writing Jobs claims to offer you thousands of dollars in free writing tools. However, when you finally pay for and access these tools, you discover that they are nothing more than outdated videos and hastily put together tutorials offering generalized advice about writing. There is also a significant amount of material devoted to writing for so-called content mills. While content mills aren’t an outright scam, they offer no long-term strategy for making a real income through freelance writing. 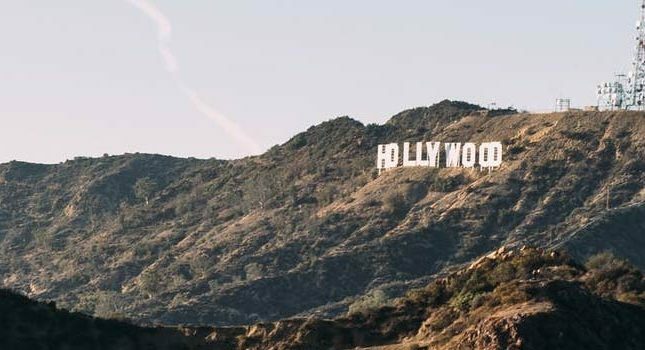 By some arguments, you might even hurt your chances of securing better and higher paying writing gigs if your name is associated with content mill work. Money back guarantee? Think again. There are many additional reports of members being charged monthly fees, of not being able to reach customer service, and of having odd random charges appear on their credit card accounts. In the above example report, the unhappy member states that Real Writing Jobs is part of a survey company. Why would a survey company operate a freelance writing site? Because, in doing so, it can have its members sign up to survey sites and collect commissions from those signups. You’ll have to opt-out of all third party advertising should you decide to sign up with Real Writing Jobs. Real Writing Jobs advertises that it has lucrative writing jobs not freely available to the public. The truth is quite different. While you may see jobs offered through this service, they are most often going to be outdated, publicly available, and low-paying. You are better off seeking writing jobs through established freelance writing websites such as Make A Living Writing. At least these sites won’t inundate you with telemarketing calls and junk mail.